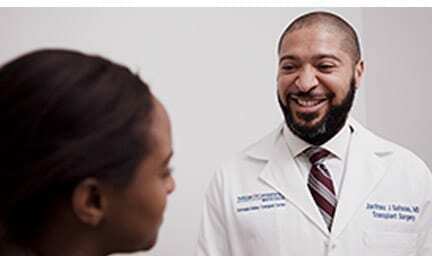 NASHVILLE, TN— TriStar Centennial Medical Center’s new surgical director of its organ transplant program, Jacfranz Guiteau, MD, is advocating for education about kidney disease, a condition that disproportionately affects the black community. Nationally, there is already a significant shortage of organs available for transplantation as each year only 15 percent of the 100,000 patients who need a kidney transplant receive one. Furthermore, the National Institutes of Health notes that black Americans are almost four times more likely to suffer from kidney disease as whites and also account for about 35 percent of kidney disease patients despite making up 13 percent of the population. The racial disparity lies in the lack of access to health education and services that result in higher rates of illnesses. Dr. Guiteau says conditions like diabetes and high blood pressure can cause damage to the kidneys and eventually lead to kidney disease. Known as “the silent killer,” kidney failure “is a very slow but very difficult process to stop,” Dr. Guiteau said. “When people start to develop kidney disease oftentimes they don’t feel anything. It does its work without giving you any symptoms until it’s far along.” Though it may sound cliché, Dr. Guiteau points out that the best treatment is prevention. He recommends seeing a physician annually to get lab work done and monitor blood pressure. Yearly check-ups can alert your primary care physician to early warning signs of diabetes and high blood pressure—conditions that often occur together in a patient and can lead to kidney disease. “If you look at kidney failure across the United States, diabetes is the number one cause of kidney failure,” Dr. Guiteau said. High blood pressure is the second leading cause, and both conditions also disproportionately affect black Americans. Dr. Guiteau advises people who suffer from chronic kidney disease to get on a transplant list early, as Tennessee’s wait to get a kidney transplant typically takes four to six years. Patients do have the option of a living donor which can speed up the transplant wait time. “The number of available donors in the United States is pretty much stagnant every year,” Dr. Guiteau said. “The only way to really increase the number of people who are able to be transplanted is to increase the number of live donor kidneys.” On average, kidneys donated from live donors can last twice as long as those received from a deceased donor. Dr. Guiteau, with the support of TriStar Centennial’s staff, is fighting the statistics with a “grassroots” initiative that involves outreach to other medical professionals, dialysis centers and media to spread education about kidney failure and the benefits of kidney transplantation, especially with living donation. He hopes that people will see TriStar Centennial’s transplant program as a resource for information about chronic kidney disease. If you’d like to know more about chronic kidney disease or transplantation, you may call TriStar Centennial Medical Center’s Organ Transplant Program office at 615-342-5626.